This article is about the English nursery rhyme. For the film, see Old King Cole (film). For other uses, see King Cole (disambiguation). "Old King Cole" is a British nursery rhyme first attested in 1708. Though there is much speculation about the identity of King Cole, it is unlikely that he can be identified reliably as any historical figure. It has a Roud Folk Song Index number of 1164. The poem describes a merry king who called for his pipe, bowl, and musicians, with the details varying among versions. The "bowl" is a drinking vessel, while the "pipe" may be either a musical instrument or a pipe for smoking tobacco. The song is first attested in William King in his Useful Transactions in Philosophy in 1708–9. There is much speculation about the identity of King Cole, but it is unlikely that he can be identified reliably given the centuries between the attestation of the rhyme and the putative identities; none of the extant theories are well supported. William King mentions two possibilities: the "Prince that Built Colchester" and a 12th-century cloth merchant from Reading named Cole-brook. Sir Walter Scott thought that "Auld King Coul" was Cumhall, the father of the giant Fyn M'Coule (Finn McCool). Other modern sources suggest (without much justification) that he was Richard Cole (1568-1614) of Bucks in the parish of Woolfardisworthy on the north coast of Devon, whose monument and effigy survive in All Hallows Church, Woolfardisworthy. It is often noted that the name of the legendary Welsh king Coel Hen can be translated 'Old Cole' or 'Old King Cole'. This sometimes leads to speculation that he, or some other Coel in Roman Britain, is the model for Old King Cole of the nursery rhyme. However, there is no documentation of a connection between the fourth-century figures and the eighteenth-century nursery rhyme. There is also a dubious connection of Old King Cole to Cornwall and King Arthur found at Tintagel Castle that there was a Cornish King or Lord Coel. Further speculation connects Old King Cole and thus Coel Hen to Colchester, but in fact Colchester was not named for Coel Hen. Connecting with the musical theme of the nursery rhyme, according to a much later source, Coel Hen supposedly had a daughter who was skilled in music, according to Geoffrey of Monmouth, writing in the 12th century. In the 19th century William Chappell, an expert on popular music, suggested the possibility that the "Old King Cole" was really "Old Cole", alias Thomas Cole-brook, a supposed 12th-century Reading cloth merchant whose story was recounted by Thomas Deloney in his Pleasant History of Thomas of Reading (c. 1598), and who was well known as a character in plays of the early 17th century. The name "Old Cole" had some special meaning in Elizabethan theatre, but it is unclear what it was. King Cole is often referenced in popular culture. One of the world's smallest books is about Old King Cole. It measures 1mm x 1mm and was printed in Paisley, Scotland in 1985. There are only 85 known copies. In 1927, Moshe Nadir (1885–1943) published a Yiddish adaptation of "Old King Cole", "Der Rebbe Elimelech". It has since become a popular Yiddish folksong. The progressive rock band Genesis included a version of the traditional rhyme on their song "The Musical Box", from their 1971 album Nursery Cryme. Dance with the fiddlers three. It has also been used repeatedly in Sesame Street, using the fiddlers as a way to illustrate principles of basic addition (with Ernie taking the role of Old King Cole), and again with William Wegman's dogs on the show (with Chundo as Old King Cole). Pop singer Nat "King" Cole (actual surname Coles) said his nickname was inspired by "Old King Cole". The "King" in Nat Cole's name was usually used in quotation marks during his lifetime, but today it is often seen as though it were part of his name. Cole Alexander of Atlanta punk band Black Lips has also adopted the name, and performs solo as Old King Cole Younger, a name also partially derived from Confederate guerilla and later Old West outlaw Cole Younger. and a merry ol' soul was he, uh huh. and he called for his privates three, uh huh. Beer! Beer! Beer! cried the private. to the airborne infantry, uh huh. The cadence includes verses for ranks from private to general, in the form of a cumulative song; each verse included a satire at the expense of each rank: "Beer beer beer" said the privates, "Where's my three-day pass" said the corporals, "Drill drill drill" said the sergeant, "Who's gonna read my map" said the looie, "Who's gonna shine my boots" said the captain, "Who's gonna drive my jeep" said the major, "Who's gonna mow my lawn" said the colonel, "Who's gonna walk my dog" said the general. A version of the cadence can be heard on the 1960 album Belafonte Returns to Carnegie Hall by Harry Belafonte. Another can be found in a 1929 music book, "Sound Off!" Soldier songs from Yankee Doodle to Parley Voo" by Edward Arthur Dolph. The Pickwick Papers (1836) by Charles Dickens contains a short tale called "The True Legend of Prince Bladud" concerning the founding of the city of Bath that is read by Pickwick while he is staying in the city. Within this Dickens describes "the famous and renowned Lud Hudibras, King of Britain", comparing him in likeness to "the venerable King Cole". In his 1897 anthology Mother Goose in Prose, L. Frank Baum included a story explaining the background to the nursery rhyme. In this version, Cole is a commoner who is selected at random to succeed the King of Whatland when the latter dies without heir. With pipe on bowl. Terce for a fiddler, sixt for makmerriers, none for a Cole. Joyce is also punning on the canonical hours tierce (3), sext (6), and nones (9), in "Terce ... sixt ... none", and on Fionn MacCool and his Fianna, in "fiddlers ... makmerriers ... Cole". 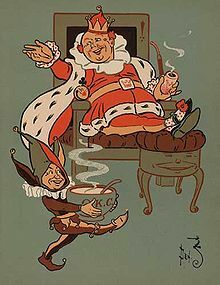 The Old King Cole theme appeared twice in 1933 cartoons: Walt Disney made a Silly Symphony cartoon called "Old King Cole", in which the character holds a huge party where various nursery rhyme characters are invited. Walter Lantz produced an Oswald cartoon the same year, entitled The Merry Old Soul, which is in reference to the nursery rhyme. "Farmer Giles of Ham" (1937) by J.R.R. Tolkien is stated (despite anachronisms like blunderbusses) by the author to take place "after the time of King Cole, but before king Arthur". The Three Stooges' 1948 short film "Fiddlers Three" features Larry, Moe and Shemp as musicians in King Cole's court who must stop an evil wizard from stealing the king's daughter. Characters based on Cole have featured in other video games. In Banjo-Tooie (2000), there is a boss opponent named Old King Coal whom the duo battle over control of a steam train. After King Coal states he wishes to battle Banjo and Kazooie, Kazooie reples "But you're supposed to be a merry old soul! ", further referencing the rhyme. In the online game AdventureQuest Worlds (2008) there is also a non-player character called Old King Coal. In the 2009 animated movie Happily N'Ever After 2: Snow White—Another Bite @ the Apple, Old King Cole (voiced by Cam Clarke) is amalgamated with the king who is Snow White's father. Old King Cole, Cole, Cole, Cole, Cole, Cole, Cole. Carlin's intonation of the final line suggested that the pipe and bowl should be interpreted as marijuana references. In political cartoons and similar material, especially in Great Britain, sometimes Old King "Coal" has been used to symbolize the coal industry. ^ a b c d e f I. Opie and P. Opie, The Oxford Dictionary of Nursery Rhymes (Oxford University Press, 1951, 2nd edn., 1997), pp. 134–5. ^ "U.S Army - Old King Cole". YouTube. 10 February 2008. Retrieved 15 July 2016. ^ ""Sound off!" : soldier songs from Yankee Doodle to Parley voo (Musical score, 1929)". WorldCat.org. Retrieved 15 July 2016. ^ Paul Reakes. Old King Cole: A Pantomime. Books.google.ie. Retrieved 15 July 2016. Huntingdon, Henry of (c.1129), Historia Anglorum. Kightley, C (1986), Folk Heroes of Britain. Thames & Hudson. Monmouth, Geoffrey of (1136). History of the Kings of Britain. Morris, John. The Age of Arthur: A History of the British Isles from 350 to 650. New York: Charles Scribner's Sons, 1973. ISBN 978-0-684-13313-3. Opie, I & P (1951), The Oxford Dictionary of Nursery Rhymes. Oxford University Press. Skene, WF (1868), The Four Ancient Books of Wales. Edmonston & Douglas. This page was last edited on 24 March 2019, at 23:31 (UTC).